Well, we are well and good into November! Cray-zay! Even more crazy is the glorious, totally unusual for November, weather that we have enjoyed this week. Lots of sunshine. Lots of warm weather. Several days in the 70s. It made for a pretty mid-fall week. The golden sun rays glinting off the autumnal hued trees. Besides enjoying the nice weather, I have been quite pleased with the lighter mornings again. I know they won't last very long, but it is so nice to run in the light and not in the dark, though I am going at the same time as last week. It just feels more safe and motivating. Thanks to all who read my home-schooling post this week. It ranks (by far) as my more popular post this year. Hmmm. I really have no idea why. Maybe because even was curious to know what I hate about home-schooling? This week I played catch up on some cleaning. Everything really needed a good scrubbing last week, but I was sick. This week I made sure to give everything a once over-even the cupboard fronts. Currently, I feel much better about the condition of my house. I started reading the Iliad this week. I don't know why I waited so long. It is a great book. Okay, well, book (chapter) 2 was a little dry. There were so many weird names listed that it could cause a headache if you're not careful. But, all in all, I'm really enjoying it. just what can you do about this? Nothing. and all the worse for you. If what you say is true, that must be my pleasure. to throttle you with my irresistible hands." Such an exemplary example of a loving marriage....Snort. My recipe today is one I can't believe I haven't shared here on the blog yet. 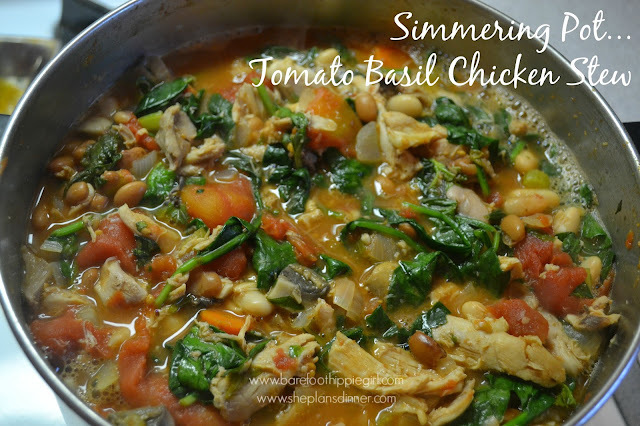 Tomato Basil Chicken Stew was one of our favorite dishes last winter. So hardy and filling, with the tomatoes, beans, and shredded chicken. It pairs nicely with a crusty chunk of bread and a crisp lettuce salad. 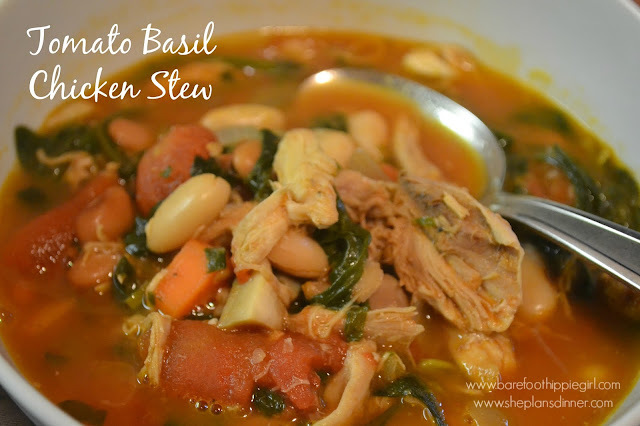 This recipe fits into my category of tasty recipes to feed people who can't eat anything. A.k.a. gluten or dairy. This has neither. For those of you who enjoyed this recipe at potluck on Sunday, I have to confess that I made it wrong. I doubled the recipe, but for some reason, I forgot to double the tomatoes. I wondered why it was "dry". As I was editing She Plans Dinner menus this week, I realized my mistake. Oh well. Now we know it's good with half the tomatoes as well as all of the tomatoes. high for 12-15 minutes or until cooked through. Cool and shred with 2 forks. -Peel and chop onion and carrots. Chop celery. Mince garlic. until the onion is soft and translucent. Add garlic and cook until fragrant, 1-2 minutes more. -Add in the remaining ingredients and stir to combine. Use a long spoon to crush the tomatoes. additional salt and pepper if needed. Serve with freshly grated Parmesan if desired.